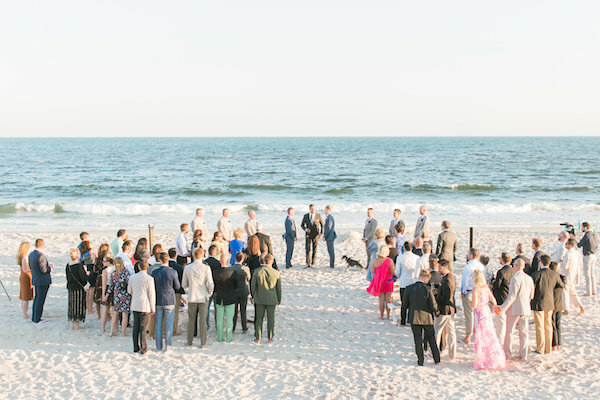 Fire Island Pines wedding. Fire Island Pines gay wedding. Whyte Hall wedding. Chris and Jeff live in Manhattan but hired us to plan a three day wedding celebration at one of their favorite places in the world: the Fire Island Pines. Planning a wedding in Fire Island is no easy feat, especially considering that there are no roads and no cars! It's challenging but the views, nature elements and sense of community are unrivaled. After a spectacular welcome reception on Friday evening, complete with a surprise fireworks display (a gift from Jeff to Chris), we were so excited for Saturday. As the guests approached the beach for the ceremony, they were offered flip-flops to change into, then greeted with champagne and a fun handkerchief featuring a quote from the Jess Glynne song "Hold My Hand" (the recessional song). Immediately after the ceremony, the grooms walked the beach and the guests walked back up the boardwalk to Whyte Hall, the theater space we transformed. For this extended cocktail reception, guests dined on hors d'oeuvres followed by a wide variety of small plates. Chris and Jeff wrote to us: We can't begin to think you for all of your help, direction, suggestions, expertise and calming voice. We could not have done this without you! Beautiful photography by Thompson Photography Group.